Tim Brown capturing a Southern Pacific Rattlesnake (Crotalus helleri), Santa Catalina Island. 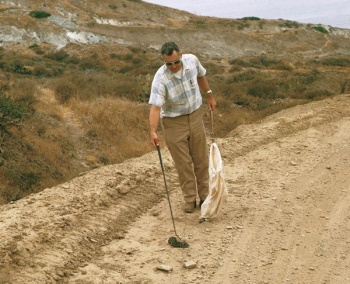 BROWN, Timothy Wallace (1934-1979) [SS#097-28-5355], associate professor of Biological Sciences at California Polytechnic University at Pomona who made frequent visits to the University of California Santa Cruz Island Reserve. He died of a heart attack at the Reserve, and his cremated remains are buried between two ironwood trees on the south-facing slope overlooking the chapel and cemetery. This page was last edited on 24 June 2018, at 12:50.